“Since the day I learned to walk, I wanted to run” S.A.
We are a creative company that combines fashion, design, tradition and innovation. We are a group that not only wants to stick to its roots but also wants to support production in Italy as a whole. Our objective is to reinterpret the classic icons and to export Italian style all over the world. The most important challenge? To make every client unique by communicating their brand values and developing an overall vision of each project. Our products are custom made, carefully following the selection of materials and colors made by our clients. Creating your identity is our mission. We provide a tailored service that is able to satisfy the needs and expectations of each and every customer. Our lead time is between 40 and 60 working days. Quick, safe and professional. We have a complete range of products for your jewelry: boxes, displays, bags, pouches, ribbons, trays, rolls, presentation materials and all sorts of complements for jewelry stores. Our products are 100% designed and manufactured in our headquarters in Italy: they are the expression of the Italian quality and creativity that is renown worldwide. Our unique style has conquered national and international markets with the help of our multilingual team. 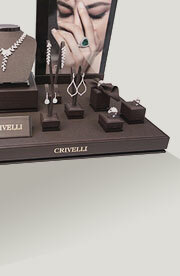 You can find us at the following trade shows: Baselworld, VicenzaOro, JCK Las Vegas, HKTDC Hong Kong and JA New York.